One morning last week, I went out to feed the animals in the bull pen. As I stepped outside, I heard the bull bellowing in what sounded like alarm. And from the field where the rest of the herd was pastured, I heard the sound of thundering hooves and bellows from multiple animals. Stuff like this always leads to a clutch of fear for any farmer, because the first thought is what kind of predator might be wreaking havoc. I dashed over to the garden fence and saw the entire herd -- including such tranquil beasts as Matilda -- galloping madly across the field. But nothing was chasing them. They were playing! The whole herd was playing tag with a magpie! 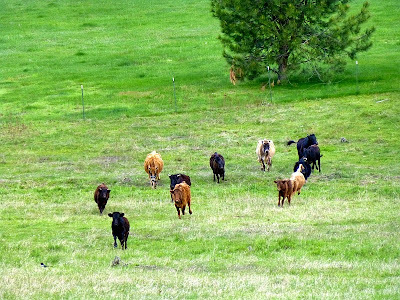 The herd galloped after the magpie up to the corner of the pasture and stopped to pant. 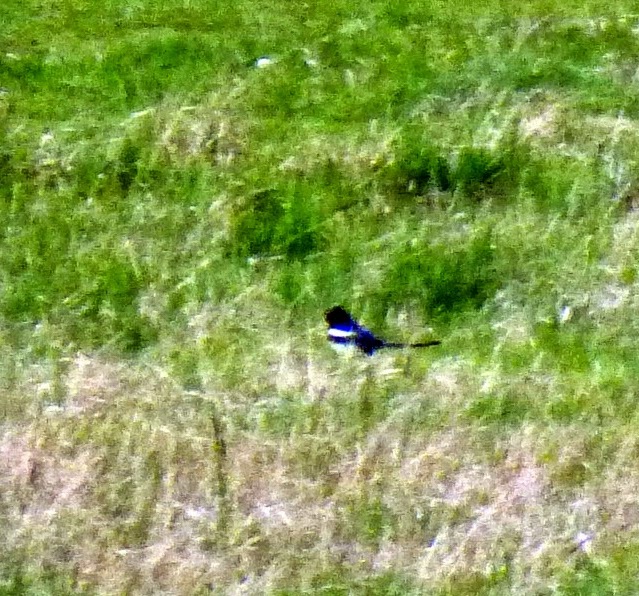 Then the magpie swooped low and landed on the grass a distance away, and they were off again, chasing it. 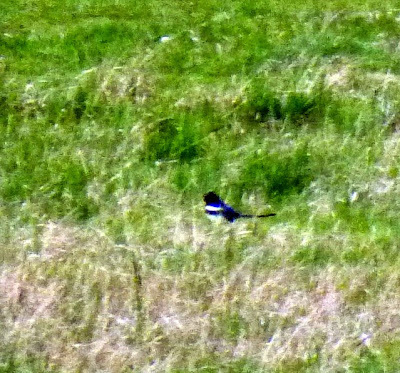 Here the magpie landed on the grass (center left) and the herd paused, panting, to watch it. Then, using whatever silent decision-making process livestock use, they decided en masse that they were done playing, and came up to get a drink of water and assure the bull they weren't hurt. Nothing more than sheer high spirits... apparently shared by the magpie. So that's where the expression "as happy as a cow chasing a magpie" comes from. I've never in my life knew that cows could play (I have seen calves play). That was a delightful gift to witness that! That is too funny and the pictures are wonderful! Never a dull moment! My dog sometimes acts like that magpie with our cattle. One time my wife and I were walking through a pasture with about 100 yearlings. The yearlings would walk right behind us and then suddenly all run by in a thundering herd. They would run about 100 yards and then stop and look at us. Then they reversed and ran past us. They repeated this four or five times. My wife was terrified. I was laughing as I told her, "Sometimes they just get bored and want to play." The coolest thing I've ever seen, like that was lambs playing. They look like wooly water flowing across the pasture. I know I sound like a broken record now . . . but you have so much wonderful material for children's books (at least the kind I would want to read to a child). Between the cows, chickens, and birds, I am sure you could come up with some delightful stories. Please keep this in mind! What's the appeal of Bad Boys? If the grid fails, will you die? Books? We ain't got no stinkin' books!